Starting in 2007, Saunders embarked on a three-year project to examine migrant neighborhoods in about twenty regions on five continents. He collected his findings in the book titled Arrival City. The book chronicles the recent shift of human populations from rural to urban areas, which Saunders argues is the most important development of the 21st-century. According to him this migration creates “arrival cities,” neighborhoods and slums on the urban margins that are linked both to villages and to core cities. He believes that the fate of these centers is crucial to the fortunes of nations. Saunders argues that what will be remembered most about our century (except perhaps changes to the climate), is the final shift of human populations from agricultural life to cities, the effects of which are being felt around the world. Doug Saunders introduces us to the migrants themselves, and with the aid of their stories elucidates their essential part in their countries’ economic fabric. He makes clear that the cities and nations that provide citizenship and opportunity to migrants stand to benefit as the migrant class evolves into a middle class; and he explains why those that ignore these people will see increased social unrest, poverty, and religious fundamentalism. 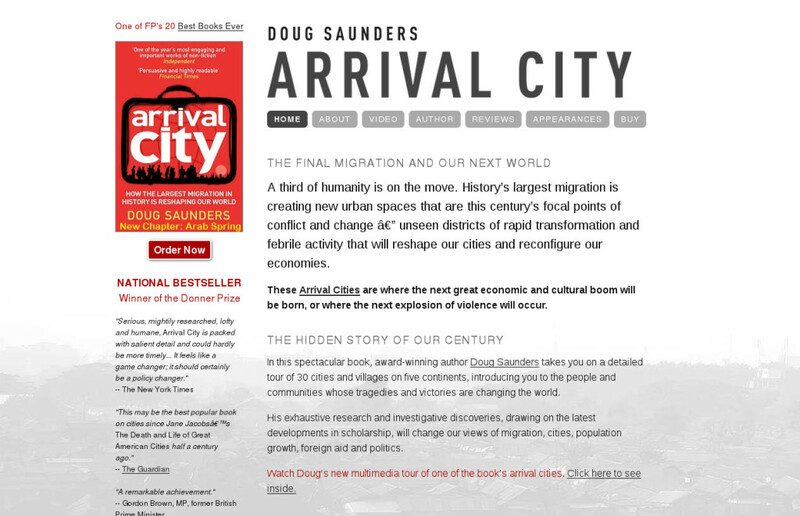 In Arrival City he argues that this migration is a story unfolding before our eyes in cities around the world, which has profound implications for the success of local, national, and international economies. Many of these arrival cities and their denizens are overlooked, willfully ignored, or even bulldozed. As Saunders shows, this is a profound mistake. Successful arrival cities create prosperous middle classes; while failed arrival cities create poverty and social problems. Saunders shows how many conflicts, revolutions and political crises have grown directly out of unsuccessful arrival cities, from Paris in 1789 when rural migrants rose up against food shortages and poverty; to Tehran in 1978, when the revolution began with non-Islamist migrants; to the suburbs of Paris and Berlin, wheredisaffected migrants have led uprisings or resorted to Islamic fundamentalism. The key, Saunders argues, is to see the opportunity of these arrival cities. By providing citizenship, a chance to own property, education, transportation links, and security, cities like Sao Paulo, or Parla have chances to grow. What he sees when he looks at these arrival cities isn’t a static condition that we could ignore even if we wanted to, but rather a point of interchange, a place where some of the most important and surprising changes of the twenty-first century are taking place. Have you heard about the massive urban shift?